ALL NEW GREAT TASTE + KETO FRIENDLY: Craving something sweet and chocolatey? Our Cookies & Cream Crisps are sure to satisfy your sweet tooth and the crunch you desire, while providing 14g of protein and only 90 calories. HIGH IN PROTEIN, LOW IN CARBS: Our Cookies & Cream crisps have as much protein as they do flavor, coming in at 14 grams of protein per serving. Looking for a healthier version of your favorite ice cream? We've got you covered. GLUTEN FREE GOODNESS & ALLERGEN FRIENDLY: Are you following a gluten free, peanut free, tree nut free, soy free or egg free diet? You're safe to snack on our protein crisps. Our crisps are also free from corn syrup, artificial flavors, colors and preservatives for a guilt free snack. LOW IN CALORIES, HIGH IN FLAVOR: Each bag of crisps contains only 90 calories, allowing you to treat yourself to the snacks you love without spoiling your diet. Counts for 2 Weight Watchers points! 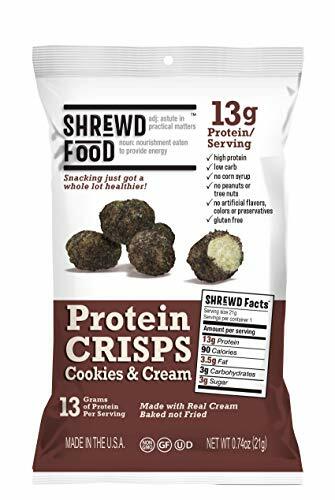 KETO FRIENDLY: Shrewd Food products are super HIGH in Protein and Taste, while being super LOW in Fat, Carbs and Sugar. Shrewd Food is for everyone that wants to eat healthier without sacrificing taste.